Okay folks, I'm finally posting this recipe! Wow, took me long enough, eh? I was busy eating, and not enough posting! So this recipe is from Leslie Mackie's "Macrina Bakery & Cafe Cookbook", found on page 161. My fellow food lover Tabitha gave me the book to borrow, and I had yet to try anything. Shame on me! 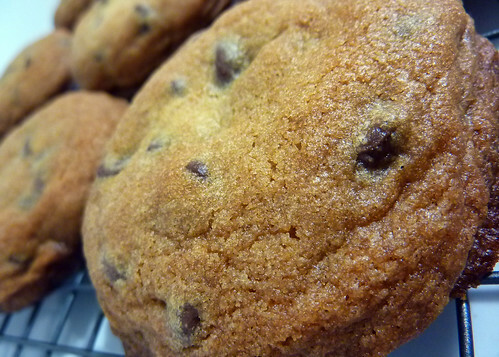 This is definitely one of the best chocolate chip recipes I have found. Chewy, chocolatey, with just a few crisp parts around the edge. Pretty much the perfect cookie, if you don't care about calories or diet. *cough! The recipe itself is called "Olivia's Old-Fashioned Chocolate Chip Cookies", and is named after two Olivia's in Leslie's life: her daughter and the grandmother of the pastry chef, Karra Wise. Apparently it's Macrina Bakery's take on the Toll House cookie. So here's the recipe! 1. Combine flour, baking soda, and salt in a medium bowl. Add chocolate chips and mix well with a spoon. Set aside. 2. Combine butter, shortening, sugar, and brown sugar in the bowl of your stand mixer. Using the paddle attachment, mix on medium speed for about 5 minutes, until the mixture is smooth and pale in color. I actually didn't used my stand mixer and got a nice arm workout using a spatula, because my mixer doesn't have a paddle. Add 1 egg and mix until incorporated. Scrape down the sides of the bowl, and add the remaining egg and vanilla extract. Continue mixing until incorporated, about 1 minute with the mixer (3-5 with your buff arms). Remove the bowl from the mixer and scrape down the sides of the bowl again. 3. Using a rubber spatula (Woot! Already have it! ), fold half of the dry ingredients into the dough. After the first batch is fully incorporated, fold in the rest of the dry ingredients and continue folding until all the flour as been absorbed. Scrape down the sides of the bowl and cover it with plastic wrap. Chill in the refrigerator for at least 1 hour. At this point the dough can be formed into cookies or stored in the refrigerator for up to 4 days. 4. Preheat overn to 350 degrees. Line 2 rimmed baking sheets with parchment paper (I used foil greased with butter). 5. Scoop dough out of the bowl (about a medium ice cream scoop) and roll the dough into 2 inch balls. Place 8 balls on each baking sheet, leaving 3 inches between each ball. Flatten the balls with the palm of your hand to about 1 inch thick. Place 1 sheet of cookies in the refrigerator while baking the other sheet. 6. Bake cookies, 1 sheet at a time, on center rack of oven for about 15-18 minutes each. To help the cookies bake evenly, rotate the baking sheet every 4 minutes or so. The finished cookies will be golden brown around the edges, and still light in the center. Let cool on the baking sheet for 15 minutes. The cooled cookies can be stored in an airtight container for up to 3 days. 670 Food Photos and Counting! My friend Kim alerted me to this article! I'm not the only one, whew! Trip down the Bayou for Happy Hour! It's been awhile since I've been to happy hour, so my friend Kristen and I decided to head to Toulouse Petit up on Queen Anne, Seattle. My other co-workers had already been there for lunch, and had pretty good things to say about the place, so of course I had to try it. When you walk in the dining area is spacious and nicely decorated. Nothing too fancy, but that was a good thing for me because I didn't want to feel like I wasn't welcome in my jeans and t-shirt. We headed to the bar area and frantically looked through the menu because we only had one hour left for happy hour. "Quick Kristen! 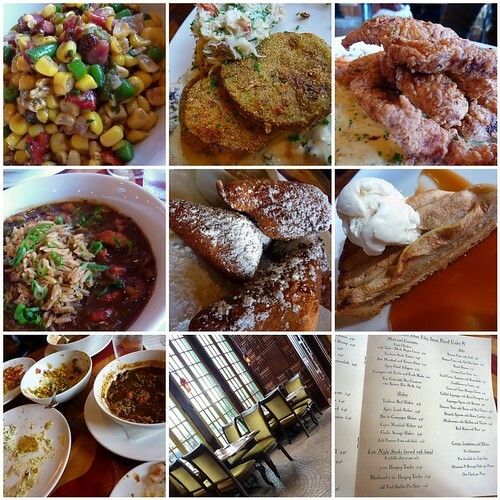 Narrow it down to 4 to 5 dishes from 40 delicious sounding menu items!" "Okay Okay! ummmm...er...uhhh...wow, there's a lot here." Everything sounded fantastic, making it harder to choose, so in the meantime the waitress took our drink orders. Kristen had a white wine ($6 or $7) and I had their Pomegranate Mojito ($6.95), which isn't really a deal, but with their menu items at $5 each, maybe that's where they were making up the difference...who knows, but my Mojito was fantastic! 10 minutes later: Waitress comes back. "Hi, can I get you another Mojito?" "Oh no, I shouldn't, WELL OKAY!" Seriously, the drinks were pretty good. Either that or I was really thirsty. Yea, thirsty that's it. So folks, if you're looking for a decent happy hour and want to try something we don't see a lot of here in the Northwest, check Toulouse Petit out. The only thing, is that their happy hour is from 4:00-5:30pm, so plan on leaving work a bit earlier. Just do what I did, and tell the boss you were just stepping out for a bit, and you'll be back...and then RUN!